Here it is, yet another Messianic Passover Haggadah. I know there are quite a lot of them out there, all of them a little different in one way or another. Well, this one is as well. I have a specific need, so I put this together to fill that need. It may not work for everyone, and that is fine. By now you may have already selected the Haggadah you will use anyway. But just in case, I’m putting this out there for anyone who may want to use it. As I said, I have a specific need. For this Passover Seder, I will have a captive audience, and I mean that literally. This Haggadah has been prepared for a small group of offenders in the Indiana Department of Corrections. We will have a limited amount of time, and I will be restricted as to what I can and cannot take into the facility. The participants, while all believers in Messiah Yeshua, have varying cultural backgrounds, understandings and expectations. Some of them will remember a Passover Seder from their childhood. 2. I have incorporated all 15 steps of the traditional Passover Seder, something I have found missing in many of the Messianic Haggadahs (not the proper plural form of that word) that I have examined. In this setting, the tradition of the 15 steps – in order – is important. I’ve marked the steps that fulfill these requirements with Scripture. The rest of them are marked as “Traditional.” Some of the men at the Seder will want to know that. Others will identify with the traditions, and for all of them it will be a very meaningful experience. 4. 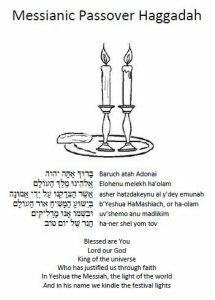 I have also included traditional Hebrew blessings (at least for the most part) and a couple of traditional Passover tunes. It isn’t filled with pictures or other images. If for some reason you don’t like the parts of the Seder that are purely tradition, no problem. It is easy to identify the “required” parts. You need to do steps 5, 8, 9 and 11, and (as Believers in Yeshua) steps 12 and 13. But even those have traditions in them, so if you are avoiding that, well, you really don’t need a Haggadah at all. Just read the story from the Bible and eat matzah and bitter herbs with your meal. Scripture references are taken from the Tree of Life Version, published by the Tree of Life Bible Society (formerly the Messianic Jewish Family Bible Society), except for one well-known passage from the King James Version. I really like this translation. It is NOT a “sacred name” Bible, so you won’t find any particular rendition of the Divine Name promoted. If you wish to print this out, first download the file here and open it in Adobe Reader. From the print dialog box, choose the booklet format and make sure you print on both sides of the page. You will use 3 pieces of paper that you can fold in half, and the pages will be in the right order to form the Haggadah booklet. And don’t forget to order the rest of your Passover supplies so that they arrive in plenty of time. If you happen to find a typo, please email me at larry@messianiclight.com and let me know. May your Passover observance be blessed. While you are keeping the feast, remember those who are unable to gather around the family table and celebrate.